Why do I need padding? 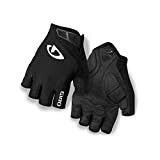 No matter what conditions you usually cycle in, a good pair of cycling gloves is a valuable part of your personal cycling wardrobe, and you want the best cycling gloves you can get. In cold weather, your hands can get cold very easily, as they’re stuck out in front of you with minimal scope for moving to keep warm. Even in warmer weather, the air movement can cool your hands uncomfortably, and even if that’s not an issue, the added grip available from a good pair of cycling gloves can make a huge amount of difference to your comfort and performance while cycling. Bike gloves aren’t just for professional cyclists; no matter what your ability and experience level may be, you can benefit a great deal from finding the right pair of cycling gloves for you. Below, we’ve broken down some of the best cycling gloves on the market in 2019 for you to help you find the right pair for your personal needs. Any of these are good choices, but we’ve broken down the most important features of each pair to help you understand which gloves best fit your requirements, making it easier to make the right decision. 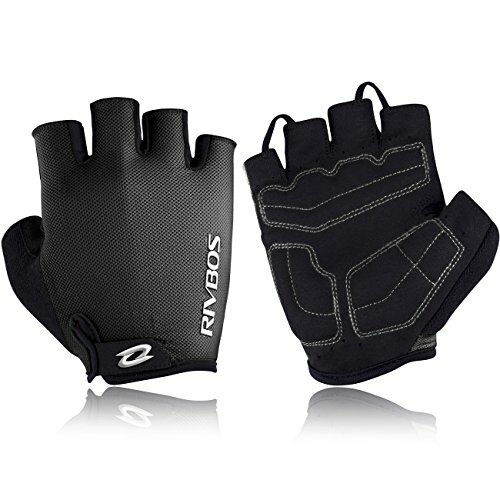 A lightweight, breathable pair of basic fingerless cycling gloves, the RIVBOS Bike Gloves are designed to offer strong gripping power and hand support without getting in the way at all. 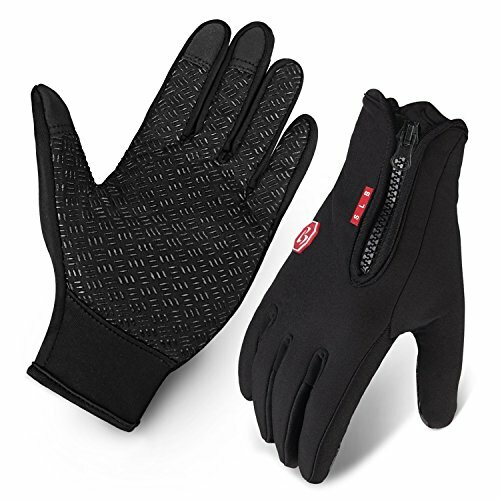 They aren’t going to keep you warm in winter, but the durable high-grip palm coating will keep your hands firmly in place on the bike no matter how sweaty your palms may get. The foam padding inside the gloves helps to absorb shock, reducing the impact and strain on your hands when cycling over rougher terrain, while protecting your palms themselves from abrasion and callusing on the handlebars of the bike. The super fiber material from which the gloves are made makes them tough and durable, but still allows your hands to breathe fully, keeping them cool and reducing sweating. Why We Liked It – The RIVBOS Bike Gloves are simple, no-frills bike gloves for those who want something unobtrusive to help them grip the handlebars a little better when cycling and to provide a little palm protection when needed. The Cycling Gloves from SLB offers a range of helpful features and slightly more warmth and protection from the elements than other options. As well as featuring touchscreen compatible metal fibers lacing the fingertips, these gloves include silicone palm grips to ensure a firm grip on your handlebars in most conditions and highly windproof construction. They are only mildly water resistant, making these a good choice for moderate weather conditions but not ideal for more extreme weather, but they should be able to cope with cycling through light rain showers with no difficulty. To provide additional warmth, the SLB Cycling Gloves are constructed from three layers of foam and polyester fabrics, keeping your hands warmer without adding too much to the bulk of the gloves themselves. Why We Liked It – The SLB Cycling Gloves are sturdy, warm gloves that don’t obstruct your hand movement too much, keeping your hands warm and safe without getting in the way very much at all. The MOREOK Shock-Absorbing Breathable Anti Slip Cycling gloves are higher end fingerless bike gloves designed for comfort in all situations. The palm of the gloves is padded with a double foam layer, ergonomically shaped to support your hand as much as possible. This protects your hands from shock impact when cycling over rough terrain, while also preventing abrasion and callusing on your palm. The pads are also coated with silicone dots, offering a stronger grip on the handlebars. Both the back and the front of the gloves are made from breathable fabrics, with small holes built into the design for added ventilation to keep your hands cool and reduce sweating. Why We Liked It – The ergonomic padding of the MOREOK Shock-Absorbing Breathable Anti Slip Cycling gloves keeps your hands safe and comfortable in all situations, providing a higher level of comfort and care than most protective designs. 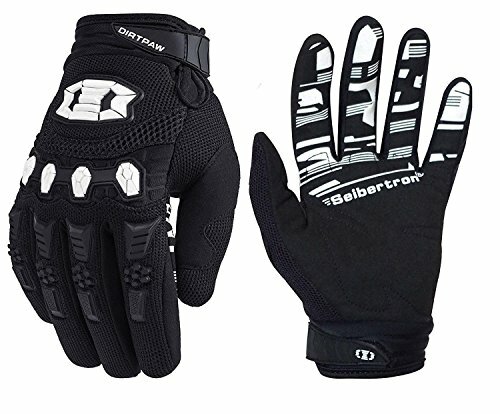 The Seibertron Dirtpaw Unisex BMX MX cycling gloves are exceptionally protective and well built, and also offer a higher level of warmth than much of the competition. 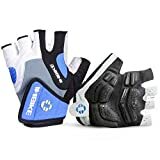 These gloves are designed for mountain biking, BMX cycling, and other more extreme bike sports, and therefore have strong rubber shielding on the knuckles and back of the hand, keeping your hands safe from injury even when cycling on more dangerous terrain. They also offer silicone grips on every finger for maximum handlebar grip strength, as well as touchscreen compatible materials in the fingertips. These cycling gloves are larger and bulkier than many alternatives, but if you’re interested in more extreme cycling, then the extra protection will more than makeup for the added size. Why We Liked It – The Seibertron Dirtpaw Unisex BMX MX cycling gloves are extra large and sturdy, designed to keep your hands safe during extreme cycling activities. There are lighter options on the market, but these are an ideal pair of gloves for anyone looking for a greater level of hand protection and warmth. The GEARONIC TM Cycling Bike Bicycle Motorcycle gloves are lightweight gloves that provide a surprisingly high level of support for your hands despite their small, light design. The palm is padded with a foam layer to absorb shock and reduce strain on your hands, while the main body of the gloves is made from an elasticized fabric to provide a high level of compression and support to your palm and fingers. The exterior surface of the palm is covered with a layer of abrasion-proof material, giving a high level of grip strength while also protecting the gloves from wear and tear for a longer lifespan. Why We Liked It – The extra compression offered by the elastic body of the GEARONIC cycling gloves is a worthwhile feature, providing a higher level of support and protection to your hands than many other options. The HuwaiH Cycling Gloves are exceptionally well padded, offering a high level of support and protection to your palms, protecting your hands from impact and absorbing shock when cycling on rougher surfaces. This padding is made from a combination of 2mm foam protection and gel pads for extra shock absorbency. The raised, padded areas are also coated with high grip silicone, ensuring that your hands do not slip on the handlebars no matter how sweaty your palms get. 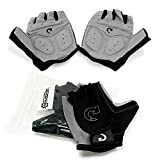 In addition to this, the body of the glove is designed with sweating in mind, with a lightweight and breathable construction to keep your palms cool and reduce sweating. Why We Liked It – Offering more padding then most, the HuwaiH cycling gloves offer a high level of palm protection. 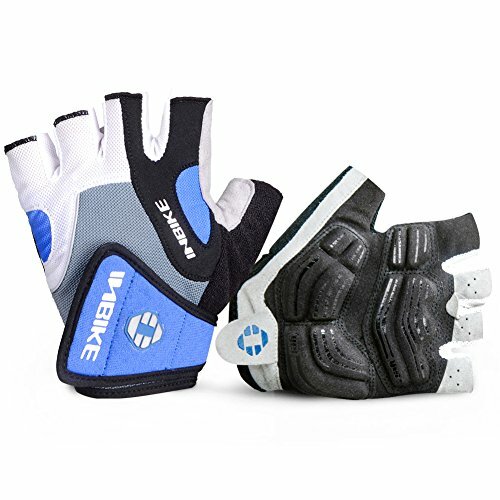 The shock absorbing the power of gel pads is greater than that of foam, and the combination of the two methods offers a very comfortable cycling experience. 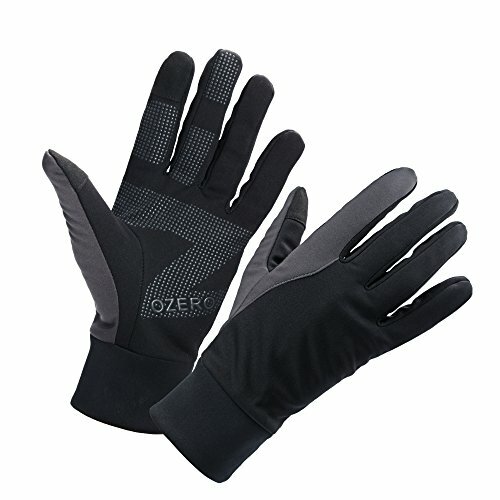 The OZERO Men’s Winter Thermal Gloves Warm are lightweight thermal cycling gloves built with a focus more on warmth than on protection, offering a moderate level of warmth in a relatively small package. They have a waterproof and windproof coating, keeping your hands warm in most conditions, although the seams are not waterproof so immersing the gloves in water is not recommended. The palm and finger surface is coated with silicone grains for added grip, although shock absorbent padding is minimal. These are ideal gloves for anyone interested in keeping their hands warm without bulky padded gloves, but perhaps not the best choice for anyone focused on peak performance. Why We Liked It – The OZERO Men’s Winter Thermal Gloves are focused more on warmth than protection. They’re a good bet for cold weather cycling and provide more finger protection than many alternatives covered elsewhere on this list. The HTZPLOO Bike Gloves are small, skintight gloves designed to be unobtrusive and feel like a natural part of your hand. They offer shock absorbent padding in the palm to reduce road vibration and strain on your hands, as well as a web of silicone detailing on the inside of the gloves to provide stronger grip on the handlebars. These are elastic and lightweight gloves, with additional finger loops to enable easy removal without turning the gloves inside out in the process. Overall, these are comfortable, versatile, and well-designed gloves with a lot of valuable features. Why We Liked It – The HTZPLOO Bike Gloves provide a tighter and more unobtrusive design than most alternatives, fitting closely and comfortably to your hands and never getting in the way despite the layers of effective padding. The Giro Jag Road Bike Gloves are a lightweight, simple pair of entry-level performance cycling gloves. Straightforward, easy, and accessible, these are designed to provide a performance and comfort boost to those who want a simple, cheap pair of gloves without worrying too much about specifications and features. 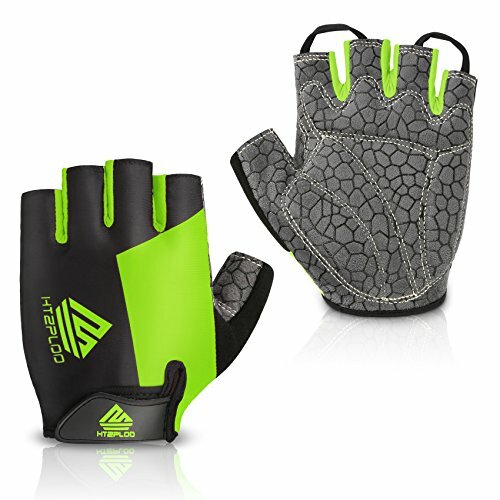 They offer a comfortable, ergonomically designed experience with no frills; the padding in the palm area is made from thin EVA foam, providing moderate comfort but not much focus on shock absorbency, while the body of the glove is made from lightweight fabrics with no heavy grip pads weighing the glove down. These are less well padded than many other options available, but they should make a difference to anyone looking for something simple and affordable. Why We Liked It – If you don’t want to have to think about different types of padding or different styles of grip pad, the Giro Jag Road Bike Gloves are a great choice for you. They don’t offer much in the way of exciting features, but they’re simple and get the job done. 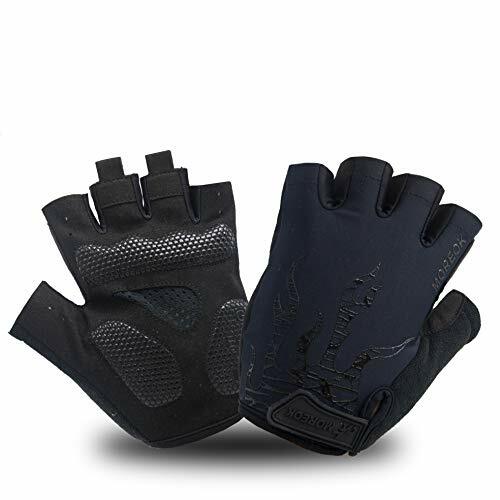 The INBIKE Cycling Gloves are durable, supportive fingerless gloves with strong shock-absorbent padding in the palms to protect your hands from impact and shock when mountain biking. This is achieved with a combination of comprehensive EVA foam cover and ergonomically distributed gel pads arranged at the points of highest pressure. 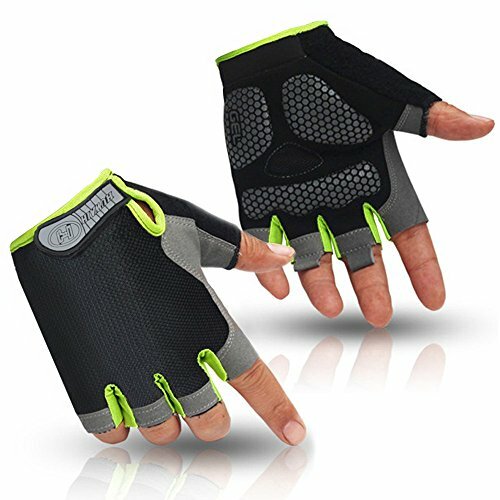 These are designed to protect your hands both when cycling and in the event of falling from your bike, positioned to support your hands as they impact against the ground. In addition to this, they feature a soft cloth area on the side of the thumb and finger, to aid in wiping sweat or rain from glasses or screens as you cycle. Why We Liked It – Explicitly focusing the design of a pair of cycling gloves on protecting your hands as you fall from the bike may seem pessimistic, but it’s a worthwhile and important safety feature that you don’t see particularly often. There is a wide range of grip pad options available, from raised silicone dots to large pads. Sometimes these are positioned only on the palm, sometimes, on one or two fingers, and sometimes on all the fingers. Of these options, the palm is the most common, with the first two fingers coming in a close second. Gloves with strong grip aids on all four fingers and the thumb are worth considering, as they will provide the most significant and most stable boost to your grip strength. You might not notice it from casual cycling, but if you ride your bike a lot, the grips on your handlebars will abrade the skin on your hands a surprising amount. This can lead to blistering and calluses, damaging your hands and ruining the skin on them. Protecting the skin on your hands is important, and most pairs of cycling gloves will help with that a great deal. The flip side of that, though, is that the gloves themselves will get significantly abraded, so it’s worth considering the material your gloves are made from. Tougher pads on the palms will help to keep your gloves in good condition, but the quality of the construction and seams of your gloves will make even more difference to their lifespan. Some bike gloves have soft, toweled pads built into the thumb and occasionally the forefinger. These are for wiping moisture off your cycling glasses or screens in wet weather; the toweled surface absorbs the moisture, and it’s built into an area of the glove that is easy to use for wiping down any surface. It may only be a small pad, but the surface area of most glasses or phones is small enough that a single thumb pad is usually sufficient. Is it an essential feature? No. Is it a nice bonus? Yes. It’s a useful extra feature that can make your life easier, but it’s far from essential. Your hands face more strain than you might expect when cycling. Yes, they’re held out in front of you with minimal movement, but they’re positioned over the front wheel, the part of your bike that takes the most shock and impact as you cycle. This can strain your arm muscles and joints and do damage to your health without your noticing it in the process, and protecting your hands and arms from this is important. Padded gloves help to absorb some of that shock before it reaches your hands, much like an additional tiny stage of suspension between the handlebars and your hands themselves. Fingerless gloves take up less space and are generally lighter than full gloves, but obviously, provide less warmth and protection from wind and rain. As such, if you do a lot of cycling in cold or wet conditions, it’s worth considering some full gloves or even specifically designed winter cycling gloves. These tend to be a lot larger and bulkier, but they offer better insulation and more protection against the elements. There are a huge number of different aspects to bear in mind when trying to buy the best pair of cycling gloves, and no two pairs of gloves are going to have exactly the same features delivered in the same manner. In order to find the right pair of bike gloves to protect your hands and help your grip strength when cycling, you need to think carefully about your bike habits and the weather conditions in which you’re cycling. Is wind the major problem, or is it rain or even snow? Do you need something compact, or would bulkier gloves be fine? How fast do you cycle? Do you even need that extra warmth, or is it all about grip and padding for you? All of these criteria are relevant to your decision, and you should consider these and more when trying to work out which pair of cycling gloves is the right one for you and your personal requirements. All of the pairs of winter bike gloves discussed above are good options, and choosing the right pair for you is a matter of personal preference rather than of one pair being objectively better than the others. Hopefully, with the information from this guide, you will feel better equipped to buy with confidence, knowing more about the criteria which you need to consider when buying a pair of high-performance cycling gloves to help you achieve your full potential.